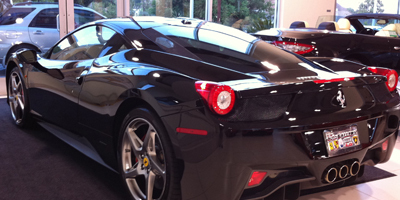 3M's revolutionary color-Stable ceramic Auto Films maintain their colors and never fade to purple. We Guarantee it! Safe with GPS and/or XM radio. 3M's Color-stable Auto Film incorporates a unique process that allows for maximum heat rejection. Not only does your car look great on the outside, but inside you get protection from the sun's heat, ultraviolet rays and glare. 3M Scotchtint Color-Stable Auto Film will help make your car cool and comfortable with less drain on your car's interior. Cloth and leather interiors are less likely to fade, crack and peel, and are not as warm to the touch. Regardless if you are using your GPS system, satellite radio, or just using your cell phone, you can count on Premium Color-Stable not to block your satellite signals. Only buy the 3M print mark. You know that your car features authentic 3M Scotchtint Color-Stable Auto Film when you see the 3M print mark on the window itself. The 3M print mark is your assurance of authenticity. Regardless of whether you choose a light, medium or dark film for your car, 3M Scotchtint Color-Stable Auto Film will give your car a beautiful look and may increase your car's resale value. Because 3M uses its very own proprietary adhesives to create a clear, strong bond, your car's sleek look is guaranteed by 3M against bubbles, peeling or blisters. Great looks and safety, too. In additions to its fantastic appearance, 3M Scotchtint Color-Stable Auto Film helps to keep you and our passengers' safe during an accident by holding glass in place. Plus, not only does the film prevent shards of flying glass, the tint can hinder thieves from seeing into your vehicle. Our window film is backed by a limited lifetime warranty when you have your 3M Scotchtint Color-Stable Auto Film installed by one of our 3M authorized dealers. Receiving your warranty card is your best assurance that you have the finest film available and is properly installed in our vehicle. *See limited lifetime warranty for details.